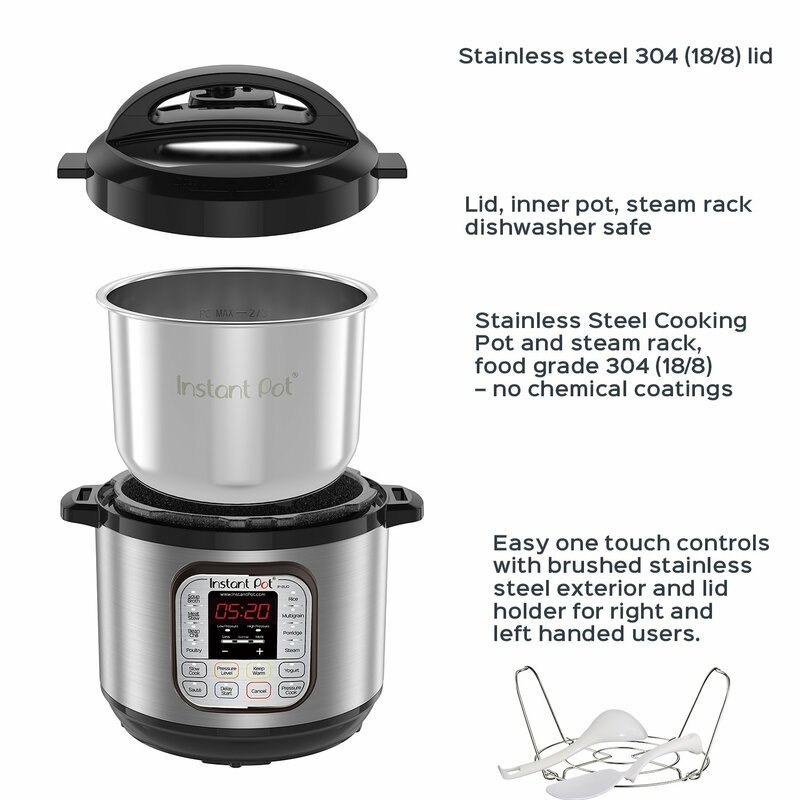 Instant Pot DUO80 8Qt 7-in-1 Multi-Use Programmable Pressure Cooker, Slow Cooker, Rice Cooker, Steamer, Sauté, Yogurt Maker and Warmer. Instant Pot is a smart Electric Pressure Cooker designed by Canadians aiming to be Safe, Convenient and Dependable. 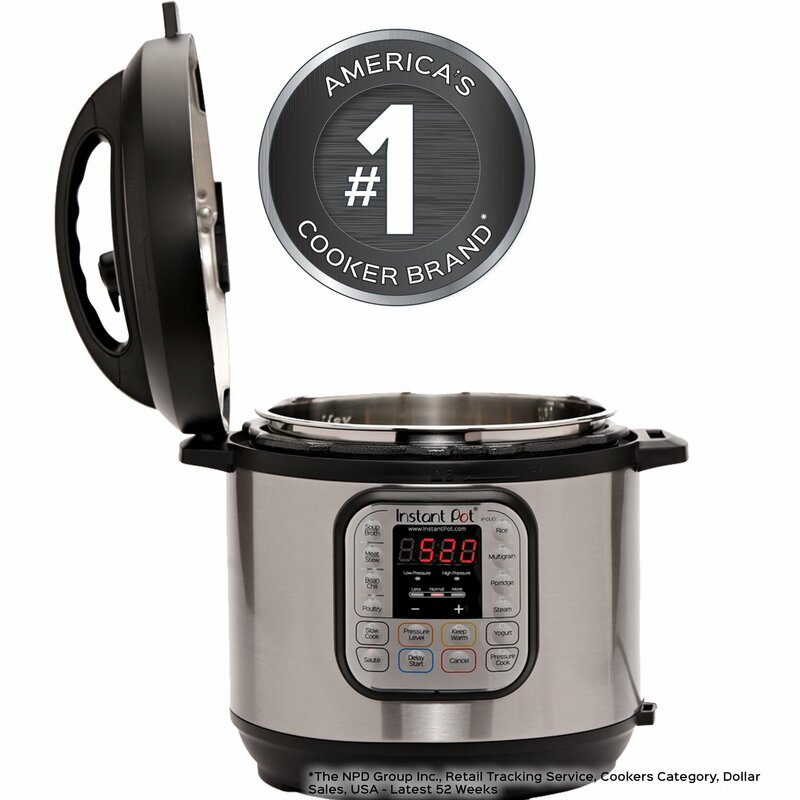 Instant Pot Duo 8 Quart is a 7-in-1 programmable cooker, it replaces 7 kitchen appliances as it has the functions of a pressure cooker, slow cooker, rice cooker, steamer, sauté, yogurt maker & warmer. 14 built-in smart programs (Soup, Meat/Stew, Bean/Chili, Poultry, Sauté, Steam, Rice, Porridge, Multigrain, Slow Cook, Keep-Warm, Yogurt, Pasteurize & Jiu Niang) cook your favorite dishes with the press of a button. A 24-hour timer allows for delayed cooking. Automatic keep-warm holds the temperature of the food until you serve it. Instant Pot generates almost no noise and leaks no steam. It traps all the aromas in the food without heating up the kitchen. The 3-ply bottom stainless steel inner pot is extremely durable and leaves no health concerns associated with non-stick coatings. The slim body design has lid holders for both left and right-handed users. The brushed stainless steel exterior is fingerprint resistant. Its elegant and durable design makes it easy to clean and pleasurable to use for the years to come. 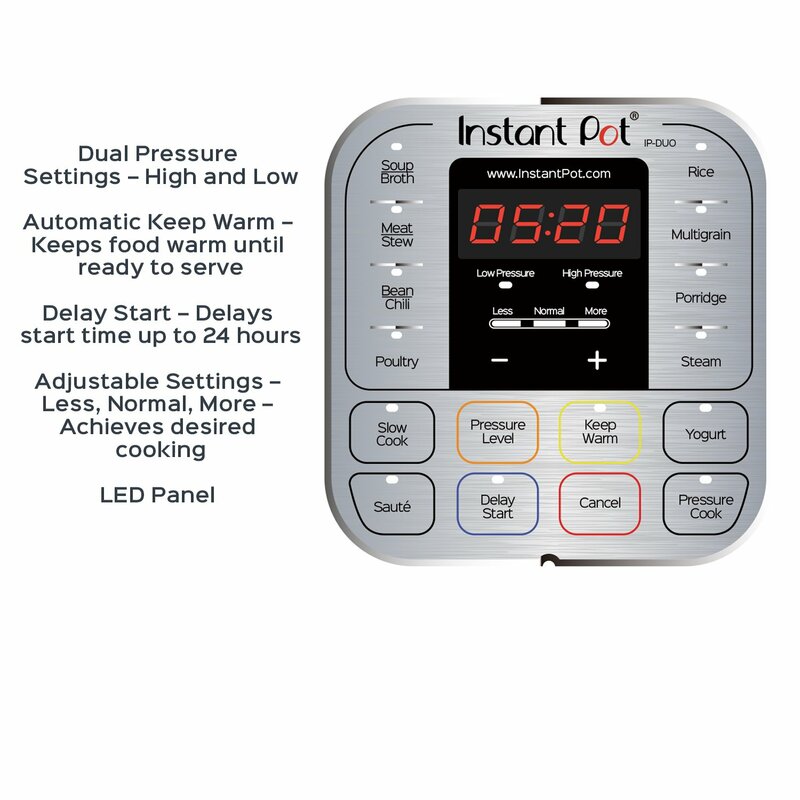 Instant Pot Duo 8 Quart uses the latest 3rd generation technology with an embedded microprocessor, which monitors the pressure and temperature, keeps time and adjusts heating intensity. The cooking programs have been lab-tested hundreds of times for optimal effect. These greatly improve the cooking result and maintain consistency. Instant Pot is carefully designed to eliminate many common errors that could cause harm or spoil food. It passed the stringent UL certification giving you uncompromised safety and peace of mind and protects you with 10 proven safety mechanisms and patented technologies.